As two of the most severely hit subsectors of the economy since 1990, U.S. apparel and textile manufacturers are the new Phoenix rising from the dead. The amazing turnaround is based on the rising value of "made in America" and the modernization of activities. American textile and apparel companies should take advantage of federal R&D tax credits available to support the innovative efforts that are fueling their ongoing renaissance. Since 1990, the apparel and textile industries experienced more job losses than any other type of manufacturing in the country. Southern states, where cotton has traditionally played a crucial role in the economy, were particularly impacted by the recent crisis. In North Carolina, 40% of jobs were in textile and apparel in 1940. This number dropped precipitously, reaching 1.1% in 2013. 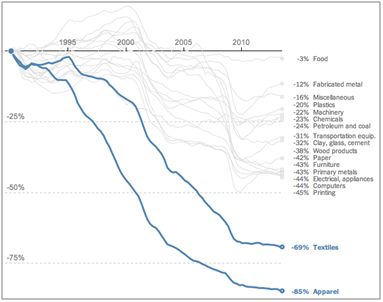 While the American manufacturing sector as a whole lost 32% of its jobs between 1990 and 2012, the textile and apparel subsectors lost 76.5% of them in that same period. The following charts illustrate the percentage of jobs lost since 1990 and the impact on industrial capacity - a measure of how much existing plants could produce. Throughout the 1990s, most of the textile and apparel manufacturing left the U.S., attracted by cheaper labor in countries like China, India, and Mexico. Across the nation, about 650 textile plants closed between 1997 and 2009. Data from the American Apparel and Footwear Association reveals that, in 1991, 56.2% of all the clothing bought in the U.S. was produced domestically. 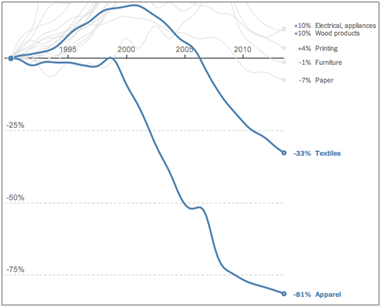 Eleven years later, in 2012, American made apparel accounted for a mere 2.5%. Source: Bureau of Labor Statistics, Federal Reserve. Originally published by The New York Times. Surprisingly, however, the U.S. textile and apparel industries are thriving again. In comparison to 2009, 2012 exports from the two subsectors registered a 37% increase, adding up to $22.7 billion. The bourgeoning renaissance is explained by rising wages overseas, high transportation costs and tariffs, significant communication barriers, along with a growing demand for the "Made in the USA" label. In 2012, a joint survey by the MIT Forum for Supply Chain Innovation and the Supply Chain Digest revealed that one-third of their 340 members with manufacturing plants overseas were considering moving some production to the U.S., while 15% of them had already decided to do so. In addition to cost effectiveness, the list of advantages of American manufacturing includes a quicker turnaround. The "Made in America" factor also plays an important role. According to a recent survey by the New York Times, 68% of those polled preferred products made in the U.S., even if they were more expensive. 63% of respondents perceived such products as being of higher quality than those manufactured abroad. Put simply, U.S. textile and apparel manufacturing is not only appealing, but affordable. The reliance upon cutting-edge, innovative automated systems of production is largely responsible for making the textile and apparel comeback possible. The so-called "smart manufacturing" has saved important American mills; such is the case of North Carolina's Parkdale, founded in 1916. The largest buyer of raw cotton in the country turned towards technological innovation as a means to enhance productivity and face international competition. With an overwhelming number of machines and robots, today's Parkdale plants bear little resemblance to the ones from a few decades ago. The textile and apparel renaissance is reviving some of the most traditional manufacturing hubs in the country, especially in the South. Southeastern states combine a rich textile history with a strategic proximity to cotton and chemical raw materials producers. The region constitutes a textile and apparel industrial cluster and therefore enjoys the benefits of economy of scale. In 2013, various national and international companies announced plans to start or expand activities in Georgia, North Carolina, South Carolina, Tennessee, and Virginia. Among the benefits offered by such states are tax breaks, reliable utilities, and modern infrastructure. More than a third of textile jobs in 2012 were located in Georgia and North Carolina. Claiming a "culture of textile manufacturing", North Carolina is actively engaged in reviving its textile and apparel tradition. In addition to promising a 28% cut in corporate income taxes by 2016, the state offered a total of $4.4 million in grants to nine textile companies that announced plans to build or expand plants in 2013. Together they will employ 993 people and invest $381 million. The reawakening of the textile and apparel industries is not limited to the traditional centers of the south. In Minnesota, demand for qualified labor is such that manufacturers are investing in novel ways to attract a new generation of factory workers. To this end, a coalition of companies partnered with a nonprofit organization and a technical college to create a six month industrial sewing program that creates skilled workers from scratch. Known as the fashion capital of the world, New York City is also home to initiatives aimed at boosting American made clothing. With the mission of reawakening and rebuilding America's fashion industry, the Manufacture NY program provides independent designers with the resources and skills necessary to produce and commercialize garments. The city's Garment District contributes $2 billion per year to the local economy and employs over 7 thousand workers. The American textile and apparel comeback has been made possible by important research and development activities aimed at increasing productivity and creating innovative materials, processes, and designs. Throughout the nation, numerous universities have been engaged in such activities. College of Textiles at North Carolina State University: Set to be the global leader in textile innovation, the College of Textile at NCSU is home to 61 leading-edge laboratories and various institutes and research centers, such as the Nonwovens Institute, the Textile Protection and Comfort Center, and the Institute of Textile Technology. Clemson University: Located in South Carolina, Clemson University's Apparel Research (CAR) has been a premier national resource for high performance textiles and related materials research. Manufacturing and supply chain optimization solutions developed at CAR have greatly contributed to its objective of revitalizing the domestic sewn-products industry. Recent advancements include the development of BalancedFlow, a supply chain execution software specially designed to maximize profits of apparel companies, and Duraseal, a unique seam that joins different substrates without compromising the barrier properties of each material. Georgia Institute of Technology - School of Materials Science and Engineering: With a more than 100-year-long history in textile research, Georgia Tech has evolved with the state's textile and apparel industries. Its current focus on advanced textiles includes employing antimicrobial technologies for use in medical applications, sweat-resistant weave architecture for athletic apparel, and intelligently designed wearable smart clothing. Cornell University: The Department of Fiber Science & Apparel Design at Cornell University is the only of its kind in the Ivy League. With a multidisciplinary approach, it builds on materials, design, biology, chemistry, engineering, and social science concepts and methods. Recent research efforts include the use of 3D body scanners to study the complex problems of clothing design and fit. Cornell's Textiles Nanotechnology Laboratory has used nanoscience to create new fibers with unique catalytic, magnetic, and electrical properties. Harvard Center for Textile and Apparel Research: The HCTAR studies the competitive dynamics of the retail-apparel-textile channel. It focuses on how technological innovations are changing the way apparel products are manufactured, distributed, and commercialized. HCTAR researchers have developed advanced computing techniques to increase the productivity of existing apparel pattern layouts. Innovative materials promise to change the face of the textile and apparel industries. The following paragraphs exemplify their revolutionary potential. One of the lightest and warmest materials in the world, Aerogel was invented over 80 years ago. Aerogel is composed of 90% air and 10% silica, whose extremely small pores (measuring 1/10,000 the diameter of a human hair) block nearly all airflow. The insulator's original brittleness represented a major challenge to its use in apparel. The recent release of thin sheets of silica packaged in polyester opened the way to innovative applications, particularly in outwear. 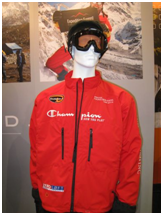 Based in Winston-Salem, NC, sportswear manufacturer Champion pioneered the use of Aerogel inside a jacket wore by mountaineer Jamie Clarke when climbing the Everest. Initially discovered in 1955, DuPont's Tyvek is a brand of highly durable, breathable and yet waterproof fiber. The synthetic paper-like material, commonly used in construction and protective apparel, was recently incorporated into Unbelievable Testing Laboratory's "impossibly light" shoes. Using Tyvek, the Las Vegas and Shanghai based, crowdfunded company developed a line of fashionable trainers that weigh only 150 grams. Capable of storing and releasing large amounts of energy, PCMs are used to regulate astronauts' body temperatures in 200-degree heat changes. Boston-based Ministry of Supply has pioneered the use of PCMs in business wear, such as the company's $100 Apollo dress shirt. The material is integrated into the fibers within microscopic capsules. When a person gets hot, the PCM absorbs energy and melts; conversely, when the wearer gets cold, the heat energy is released and the material solidifies. While the cooling and warming sensations are remarkable, the microscopic transformations in PCMs are imperceptible. Developed in the 1990s, this high-performance, non-woven, rip-stop composite laminate was originally used in world-class sailing. It has recently made its way to outdoor gear and clothing. In addition to presenting an unparalleled strength-to-weight ratio, cuben fiber is highly durable, resistant to chemicals and UV, and 100% waterproof. Maine-based Hyperlite Mountain Gear manufactures a line of ultralight backpacks made of cuben fiber materials. 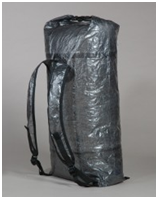 Considered the "Best Ultralight Pack" by Backpacker Magazine, it combines the convenience of cuben fiber's properties with a comfort-driven design. Though cuben fiber is slowly conquering space in the hiking world, particularly for rainwear and backpacks, price constraints remain a challenge. The textile industry is one of the greatest greenhouse gas emitters on the globe. Many of the traditional processes and products involved in manufacturing fibers, textiles, and apparel consume significant amounts of fossil fuel. With rising sustainability concerns, numerous efforts are underway to introduce recycled materials into the textile and apparel industries. An iconic example is the transformation of food products into wearable commodities. Headquartered in Fountain Valley, CA, high-tech sportswear company Virus developed an innovative way to incorporate recycled coffee beans into cold-weather performance apparel. When in contact with the skin, coffee charcoal can raise surface temperatures by 10o F. Virus's "Coffee Char" technology builds on this fact, providing a natural barrier from the cold. The use of recycled synthetics, such as plastic bags and bottles is yet another blooming field of innovation. The material is broken into fine particulates, melted, and extruded into fiber, which is then used on a variety of products. Dirtball, North Carolina-based sustainable fashion company, manufactures 100% recycled, made in America clothing, from socks to hoodies. Dirtball's polo shirts, for instance, contain 9 water bottles. Nanoscience has enabled the development of textiles with unique properties, such as increased elasticity and strength, bacterial resistance, odor and moister elimination, etc. Also known as nanotextiles, such materials are either constructed with nanofibers or formed by applying nanoparticles to a regular fabric. Headquartered in Bloomfield Hills, MI, Nanotex provides nanotechnology-based textile enhancement to the apparel industry. Nanotex's revolutionary fabrics resist spills, repel stains, control odor, and eliminate static, all of this in addition to being wrinkle free. From sportswear to business clothing, American companies are at the forefront of apparel innovation. New York-based Yogasmoga is a designer, manufacturer, and retailer of Yoga inspired athletic apparel. The company develops fiber-to-consumer technological solutions to deliver proprietary high performance fabrics. Yogasmoga's Aurum, for instance, is an innovative blend of Supplex and Lycra that offers unique durability, soft feel, and breathability. It also provides advanced moisture management and antimicrobial mechanisms made possible by advanced nanotechnology. Yogasmoga recently announced a new fabric technology named Koura. It is made from biodegradable eucalyptus cellulose fibers that are both moisture-wicking and soft. The company also created and trademarked its own color: Carbon 6 is a deep and pure black that won't fade away. In addition to offering innovative and unique designs that echo the principles of yoga, Yogasmoga is committed to 100% eco-friendly, American made apparel manufacturing. Headquartered in Baltimore, MD, Under Armour has a tradition of innovation in athletic wear. The first breakthrough dates from 1996, year when the company was founded, with the creation of the 0039 Compression T-shirt that boosts muscle performance and wicks moisture, keeping athletes cool, dry, and light. More recent efforts include the development of the UA Spine technology that provides light, responsive cushioning with flexible but supportive comfort for running shoes and the creation of the Armour Bra, designed to fit the woman's body perfectly. From Los Angeles, CA, Ortiz Industry was named one of Apparel Magazine's top innovators. The company provides fashion apparel with highly advanced performance technology solutions to meet the demands of active urban professionals. Ortiz's garments combine the functionality of athletic wear with the classic style of business wear. The company provides office-friendly clothing with highly practical features, such as moisture and odor control, 360-degree stretch and recovery, and UV protection. These are exciting times for the American textile and apparel industries. After a severe crisis marked by the off shoring of manufacturing activities, the "made in America" label is back on the rise. Coming back home makes economic sense for companies whose competitive edge is increasingly based on innovative materials, processes, and designs. Federal R&D tax credits are available to support America's renewed, innovation-driven textile and apparel industries.